Can a book start a revolution? If ever one did, this is it. The idea of celebrating the 25th anniversary of an innovative anthology emerged when a group of musicians/scholars at the Women’s Studies Research Center at Brandeis recently reflected on its value. Women Making Music: The Western Classical Tradition (Univ. of Illinois Press, 1986) was edited by two notable pioneers in the field, Prof. Jane Bowers (at the University of Wisconsin, Milwaukee) and Prof. Judith Tick (Northeastern University). Since Prof. Tick is local (and has in fact taught on women and music at Brandeis) the group invited her to give a presentation about the book and its impact, including a concert of music created by women, from the 18th _century to the present day. This event will bring together 25 noted musicians to perform in five different ensembles, one for each of the five pieces on the program at Brandeis University’s, Slosberg Auditorium on Sunday, Feb. 3rd at 7:00 pm. Maria Teresa Agnesi’s opera Sophonisba: Heroic Queen (1748) was given its modern premiere by the ensemble La Donna Musicale just about two years ago [see review here]. And for this concert, they reprise a remarkable virtuoso aria, sung once again by male soprano Robert Crowe. This exciting work promises to get the evening off with some high-adrenaline music-making. Audiences are fortunate that La Donna Musicale (directed by viola da gambist Laury Gutiérrez) is bringing Agnesi’s music to light. 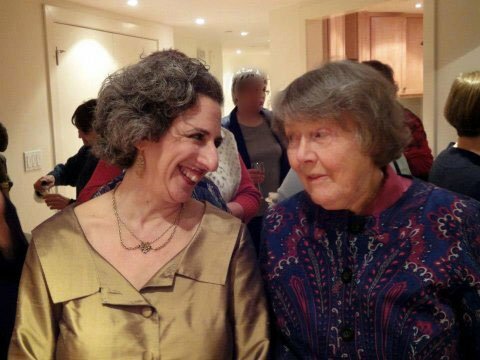 The next work, the 1926 Violin Sonata by Ruth Crawford Seeger, was chosen for the program because Judith Tick, following the publication of Women Making Music, went on to write the biography Ruth Crawford Seeger: A Composer’s Search for American Music (Oxford Univ. Press, 1997). This influential volume provided further models for dealing with all the complex issues of women composers, issues that male-focused scholarship had not been attuned to. We had to ask different questions about women’s lives and we had to figure out what those questions were. With the Violin Sonata, Crawford seems to have had crisis of self-identity. Despite the success of the work in performances in Chicago and New York City, she destroyed the manuscript, and later linked that action with destroying some childhood poetry, as if the Violin Sonata was some work of juvenilia. Clearly it is not. Fortunately, Crawford’s student Vivian Fine had a copy of the manuscript, discovered only in 1980. The raw, searing emotion of the first movement and the mystic (“mistico”) quality of the third movement are sides of Crawford’s musical personality not heard in her later works. It is an aspect of her to be treasured. Gabriela Diaz and Sarah Bob will be the performers. Next follows a new work by local composer Ruth Lomon, a portion of a chamber opera, Rebekah, based on a poem by Naomi Myrvaagnes. Both Lomon and Myrvaagnes are Scholars at the Women’s Studies Research Center at Brandeis. The Midrashic poem searches out meaning in the story and understanding of the characters in the Biblical text. Myrvaagnes’ germinating image was of Rebekah seeking to live a life that matters, and to claim agency for herself. Working together Lomon and Myrvaagnes have created the role of a narrator who makes observations and asks questions. That role will be sung by a Countertenor (Martin Near), a voice part in the same range but with a contrasting timbre from that of Rebekah (mezzo-soprano Pamela Dellal, who has worked with Lomon a great deal; the two have been in frequent communication about the piece). For the musical vocabulary Lomon draws on her study of maqam with William Elias, the Director of the Israel Music Institute (some years ago, while living in Jerusalem). Maqam is a system of melodic types or modes. Although the word maqam is Arabic, maqam is used in music of some Jewish services. The scales of the maqam use different tunings – to write it using western notation, quarter-tones must be used. Lomon has scored Rebekah for viola, ‘cello, alto flute and harp; the first three instruments can “bend” notes and be pliable with the tunings, and so can adapt to the expressive maqam. Glynis Lomon (Ruth’s daughter), known locally as a ‘cellist in the experimental music scene, will be performing on the aquasonic (also known as the waterphone). The unique sounds of the aquasonic will be featured in short semi-improvised entr’actes between the sections with the voices. Following intermission, Dellal, and Vivian Montgomery (on Brandeis’ 1827 Viennese fortepiano), perform a set of four songs by Fanny Hensel (née Mendelssohn). Hensel was known only by a handful of works before the research encouraged by Women Making Music brought the vast extent of her creative life into view. Her output of nearly 500 works includes about 300 songs. Dellal and Montgomery have recorded some Hensel songs (forthcoming) and continue to explore this repertoire. This set includes Heine’s Schwannenlied, and Die frühen Gräber, by F. G. Klopstock. The latter reveals Hensel’s skills as a creator of striking, sweeping melodies. The concert concludes with another new work by local composer Dana Maiben. Maiben is well known as an exquisite baroque violinist [here] and also director and baroque opera conductor [here]. But she is also a composer (with an MM from Smith College), and as a Visiting Scholar at the WSRC/Brandeis she has been focusing on composition. Maiben has chosen to set Martha Collin’s poem, “The Green House” from her 1985 collection, The Catastrophe of Rainbows. Collins, a highly respected poet, founded the Creative Writing Program at UMass-Boston. Maiben wrote specially for The Mockingbird Trio (contralto Elizabeth Anker, pianist John McDonald, and violist Scott Woolweaver), and added two more instruments, flute and bassoon (Jill Dreeben, and Tracy McGinnis). It was truly a delight to hear some of “The Green House” in rehearsal the other day. Pondering the style of Maiben’s music, I’m wondering if there is something quintessentially post-modern about it. Without at all seeming like a pastiche, it combines disparate threads and weaves them into a fabric of unexpected textures and colors. It is all carefully designed to enhance Collins’ thoughtful and introspective poetry. At times it is playful, whimsical, dancelike; or undulating, dreamy and sensual like Debussy; or with the driving propulsion of John Adams. The different influences evoke memories, scents, moods. The Green House is a set of six poems, and Maiben creates a frame by setting the title with a truly medieval flourish (of open fifths and octaves). Anker’s voice is nuanced, with a pearly tone, and she is highly sensitive to the shape and inflections of the words. The poetry is evocative and understated, and Maiben’s music is often lushly illustrative, and sometimes literally so. With its two notable premieres, and historic works of remarkable artistic significance, this Gala Concert promises to be a very special offering. It is being produced by the Women and Music Mix, a group of music scholars, composers and performers at the Women’s Studies Research Center of Brandeis University. I am happy to be a part of this exciting group! Ticketing for the Gala Concert is through Brandeis ticketing, or at the door. Tickets $20 / $15 seniors and Brandeis community / $5 students. More information here. Got to hear the dress rehearsal of the Lomon this AM, which was exquisite. There is such a sensuality about it, in the interweaving of the sinuous lines. Also, when when the mezzo and countertenor sing together, the sound is otherworldly! Not to be missed! AND later today got to hear some of the Fanny Hensel (nee Mendelssohn) pieces — Montgomery played an Allegro molto (1846) on the fortepiano that was breathtaking. And Dellal joined her in a setting of Goethe’s Gegenwart,a song I had not heard before and found exciting and intense. Hensel writes strophic settings that have a range of emotion that is not often found in the form.